The IBM POWER7+™ processor is available at frequencies of 3.1 GHz, 3.4 GHz, 3.5 GHz, and 4.0 GHz. The newly introduced POWER7+ dual chip module (DCM). New 10GBase-T options for the Integrated Multifunction Card that provides two USB ports, one serial port, and four Ethernet connectors for a processor enclosure and does not require a PCI slot. 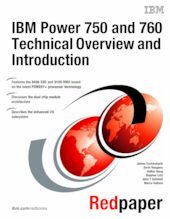 This Redpaper expands the current set of IBM Power Systems documentation by providing a desktop reference that offers a detailed technical description of the 750 and 760 systems.